Arigna Natural Gardens » Daphne’s new shoes, wood collecting etc. 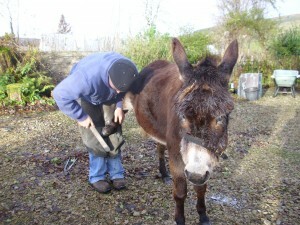 Daphne (our donkey) had a visit from our local farrier, Gerry Guihen on Friday. As farriers are a dying vocation in Ireland we consider ourselves to be lucky to have a good one like Gerry living in Drumshanbo. 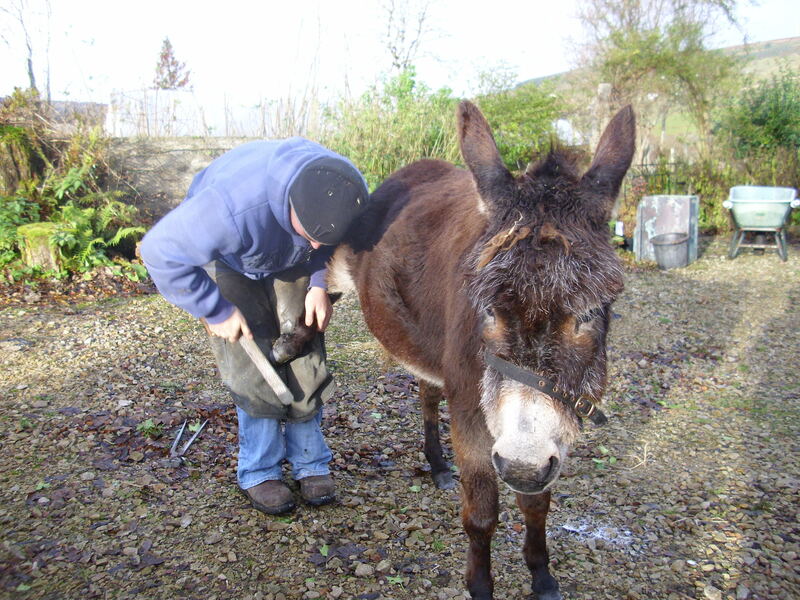 A donkeys hooves grow fast so they need to be pared about every 3 months. We collected a couple of loads of firewood last week. Lots of ash trees have been uprooted in a local wood and just dumped there. Never ones to look a gift horse in the mouth we went down with our bow saws, sawed the trees in lenghts, and filled the car to capacity. In the sunny days last week it was lovely to be in the woods. 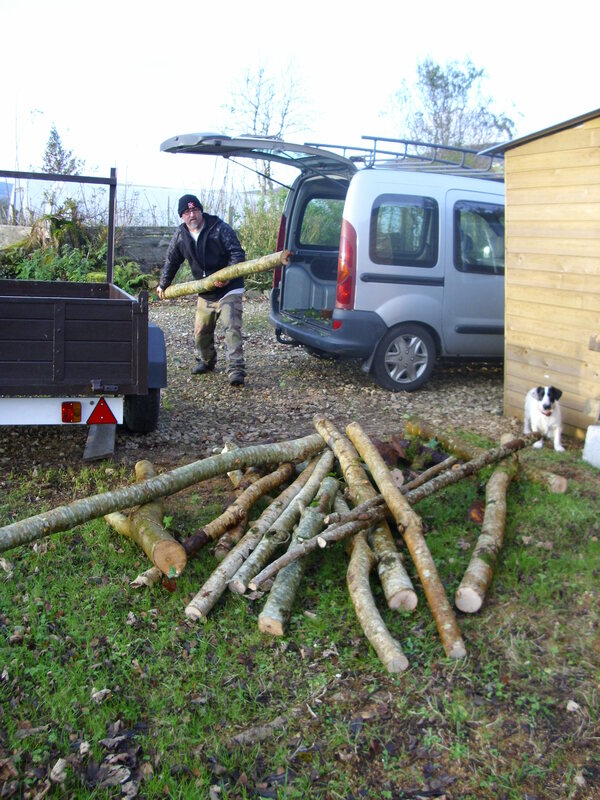 We got rid of our oil heating 2 years ago so free firewood for our solid fuel stove is always welcome. We have yet to meet anyone else collecting firewood or indeed anything else that nature offers, blackberries, wild raspberries, etc, are all not seen as of any value by most people. Maybe the austerities that are to come will change people’s attitudes to nature’s free offerings. That would be at least one good thing to come out of the ruination of our country. When down in the woods or walking we also collect ivy. This is much enjoyed by the animals and is said to be a preventative for fluke. The goats will even strip the bark from the branches. 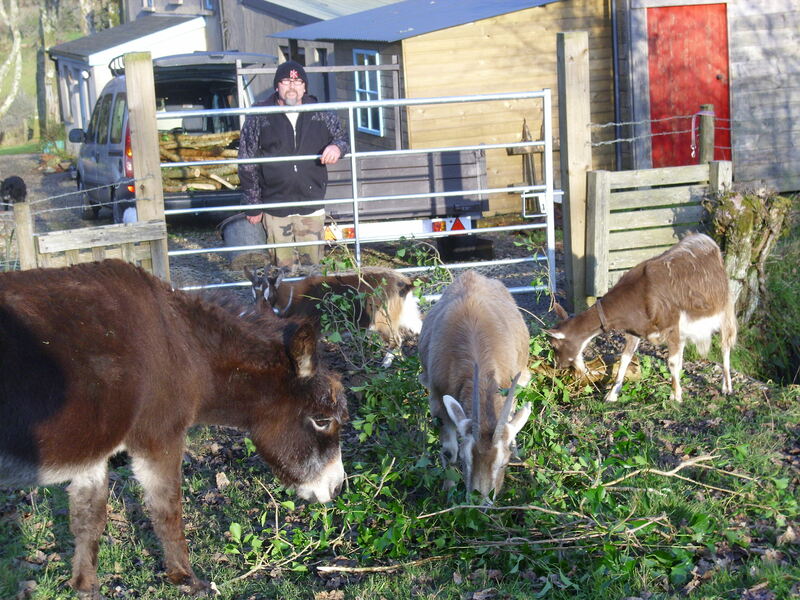 Spring cleaning Daphne ‘n’ the girls shed!. 1 comment to Daphne’s new shoes, wood collecting etc. You’re so right there Bridget…austerity will make people think more productively…on the positive side that is! The Ash burns so very well!